It can be done — promise. Since all of you CF readers are into fashion in some form (or fashion), you all know that trends come and go, and eventually a trend will be cool, go out of style, and eventually come back “in” again. This is the way the fashion world works — and we fashionistas just roll with the punches! Menswear has been a hot trend for a while. In a world when women are becoming more empowered and conquering more stereotypes than ever, it is no surprise that these items are trending. Our desire to dress up in business suit separates with sharp, impenetrable edges signifies a shift in traditional gender roles. Women can and will take care of their work life and their home life. We’re that good. As such, this week’s Fabulous Find follows a similar strong-willed attitude. 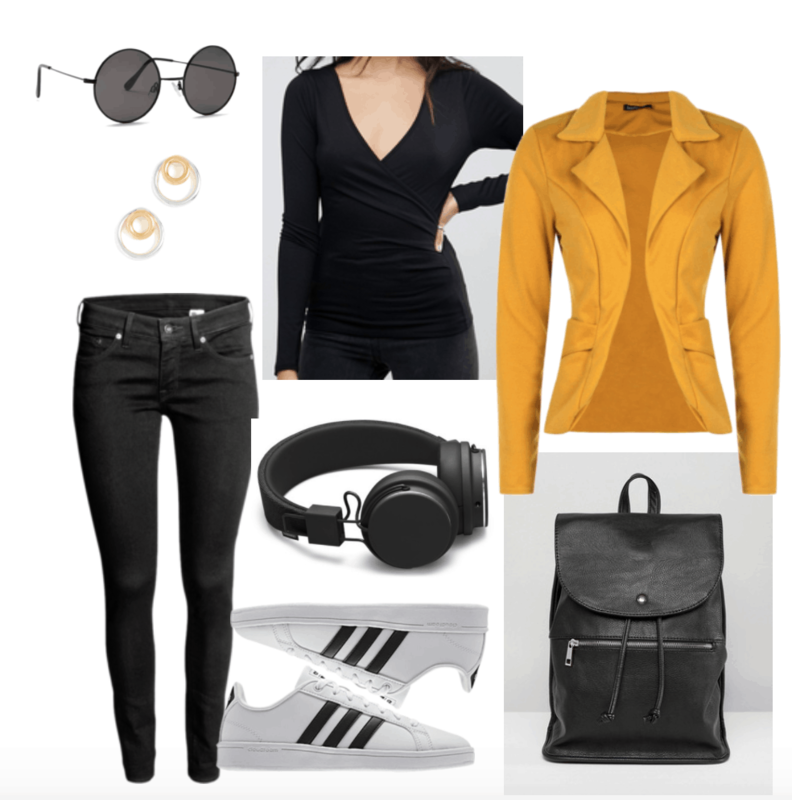 What better way to get your #GIRLBOSS on than with a unique mustard-colored blazer that won’t break the bank? Ladies, it’s only 12 bucks. Swoon. As you head into new classes, new profs, new schedules, and overall newness, hold your head high, and be bold (especially in your outfit choices!). Need some style inspo? Scroll down for 3 outfits including this fab blazer. For our first look, we’re going to defy blazer stereotypes that say we can only wear them in a business setting — I say no to that. Slip your blazer over a black wrap long sleeve top and some classic black skinny jeans. Black and white Adidas sneakers bring a perfect amount of street chic to this look. Go for black accessories for this look. Black circle sunglasses and black headphones (that you’ll wear around your neck, obvi) are super retro and contrast nicely with the pop of the blazer. A black backpack will hold all your goodies and give an edginess with the leather look. And for a bit of glam, slip in some silver and gold stud earrings. You look fly (and def class ready). Interested in more of a preppier take? Never fear — Cher Horowitz from Clueless has got you covered. This look is perfect for an internship, job, or class that you like looking *extra* nice for. Under your blazer, slip on a white ribbed crop top with fancy lace-up sleeves. A tweed button-up skirt screams Cher, IMO, and makes you look as preppy as can be (and as studious!). Knee-high socks are the prep girl go-to, and look fab with black ankle booties. Step up your accessories with gold and yellow earrings and a green and gold crossbody purse for more color, texture, and, you know, fun. A swipe of black nail polish is the perfect finishing touch. Gawgeous. The third and final look is for a sweet trendsetter. Mustard, navy, gold, and a bit of black? You may think I’m crazy, but I think it’s bold (and who doesn’t want to be bold?). Slip on a super unique + retro navy and gold dress covered in nothing other than horses — LOVE. Navy velvet ankle boots are the right amount of matchy-matchy that still looks perfectly put together. For accessories, you can’t go wrong with a baker boy cap, especially if it’s of the tweed variety. Carry your phone and lipgloss in a navy and gold clutch, and decorate your fingers with lovely gold rings. A swipe of Essie’s “Caviar Bar” is the cherry on top. You are one stylish lady. What do you think? Would you rock a mustard-colored blazer? How do you feel about menswear? Let me know in the comments below.